This Elna Supermatic was Swiss made and seems to have the same degree of perfection as a fine Swiss watch. Since they are made of lots of metal, they run quite smoothly with very little vibration. Jim has trouble adapting to the Elna knee control after using his other machines with foot controllers. Stamped on the bottom is "7 FEV 1957" so we assume that to be the date of manufacture in Switzerland. This Supermatic, unlike our Transforma, has a compartment to insert discs which are used to produce attractive patterns. All machine controls are contained in this area. Stitch length is controlled by the slider going up and down. The slider has adjustable stops. Stitch width is regulated using the control which moves left-right. The image above shows installation of the bobbin. 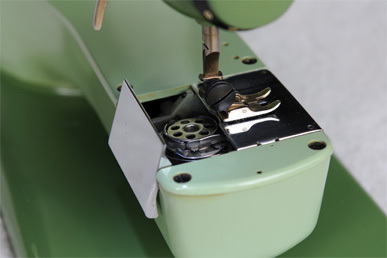 There is no bobbin case like ones used on some other machines. The accessory tray is stored under the freearm. We were lucky in this machine in that many of the accessories were with the machine when we found it. The kit contains a seam ripper of the same color which has a broken point. 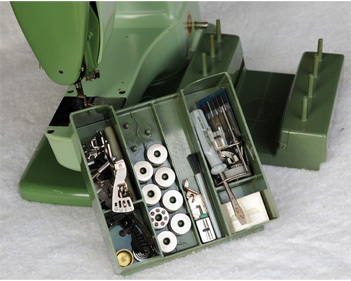 Pictured above and below are two more of our Elna Supermatic Sewing Machines. These machines may look a lot alike, but there are huge mechanical differences in them under the same skin. The zig-zag feature requires the installation of a plastic cam in the compartment on top. There are many people who appear to be cam collectors (including Jim) who often get into bidding wars on eBay trying to amass a complete collection of the little plastic disks. The machine has a free arm and the carrying case can double as a working surface as shown above. It is direct-drive and therefore does not have a drive belt. 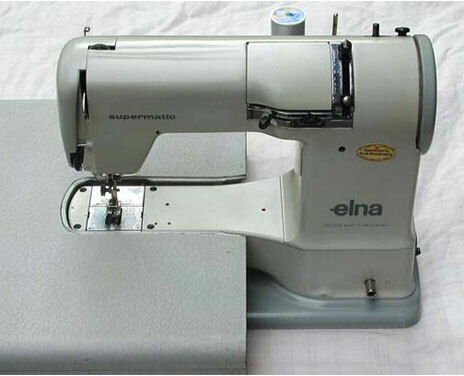 Elna produced the first automatic decorative stitch in 1952. 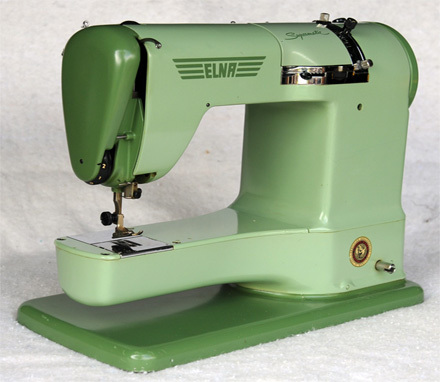 Elna machines were in the forefront of machine design and other manufacturers often copied their designs. 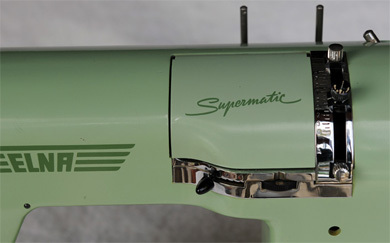 Production of the Supermatic began in 1952. I thank Karl Riemer for the following words regarding adjusting the Supermatic handwheel:A Supermatic handwheel slides onto its shaft and turns freely until fixed there by a knurled nut screwed over a washer that has 2 bosses on the inside and 3 on the outside. 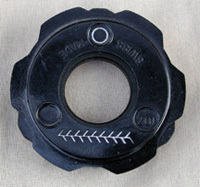 The out-facing ones constrain the nut's set screw, which is turned in last, after the nut is seated. The in-facing ones engage 2 of 4 grooves cut in the shaft to lock the whole assembly to the gears. Unlocking is accomplished by backing off the nut ~ 1/8 turn to let the washer slip against the handwheel, thus uncoupling the gears from the motor. The washer is simple, but ingenious, because there's no way to predict exactly which 1/8 turn is going to be the sweet spot between just tight enough and too loose. So the set screw is constrained within 1/3 turn but the washer has two positions (because 2 bosses go in 4 grooves) so there are actually 6 ranges available. Trial and error is the only way to get it right, but if the nut, with set screw turned in and everything seated properly, can't quite snug up the handwheel (in other words it bumps into its limiter boss before everything is locked together), simply take the nut off, turn the washer 90° either way and thread the nut back on. The limiter bosses will now be shifted relative to the shaft ever so slightly, enough that the 1/8 turn range will now fall entirely between two of them. The goal is for a finger tight nut positioning the set screw just coming up to a boss without actually touching it, so you don't have to physically test, you can just look behind the handwheel when you thread on the nut and see where the set screw lands. On or ahead of a boss means the washer needs rotating; behind is golden. 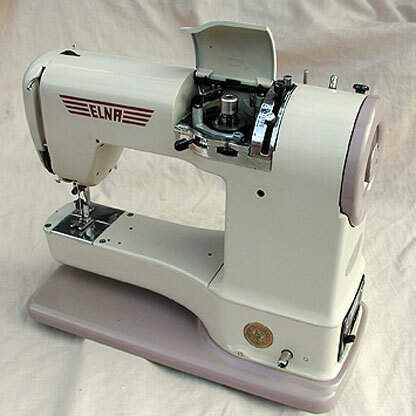 Some Elna machines require cams to make fancy stitches. Each is identified by a number and picture of the pattern it produces. The top picture on this page shows where cams are inserted. The pattern the cam on the right creates can be seen in the photo. 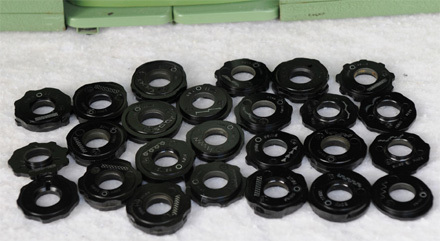 Some discs have a single cam and others have two cams depending on complexity of the pattern. Click here to see the list of Disc Patterns.